Acupressure Mat and Pillow Set with Bonus Carry Bag. 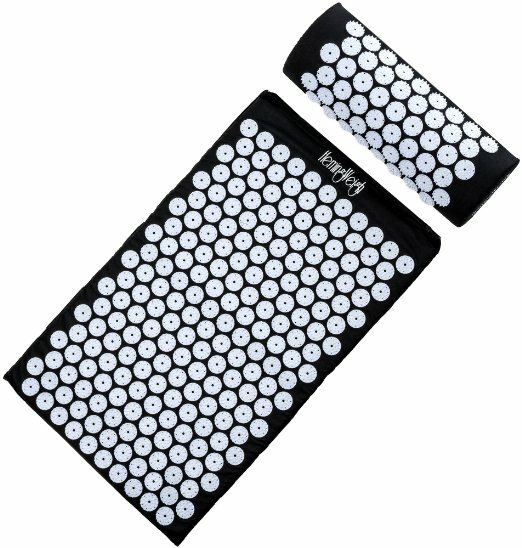 "The HemingWeigh Acupressure Mat is an effective wellness tool for relieving back pain and muscle tension while promoting stress-relief and relaxation. The mat is believed to increase circulation and blood oxygenation and is suitable for people with low levels of energy, high levels of stress, insomnia, backache and depression. By releasing this inner tension, we release a lot of the problems from depression to tense neck / shoulders and poor digestion. Regular use of the mat will help with this.With its Indian origin dating back thousands of years, the bed of nails is a well tested tool for healing the body. It has been used by Indian Yogis (yoga practitioners) throughout time to attain perfection of body and mind, and to reach deep inner peace. The original bed of nails was constructed of wood and metal nails. It helps to promote the release of the bodyÃ¢â‚¬â„¢s own pain-relieving and happiness hormones Ã¢â‚¬â€œ endorphins and oxytocin- which help to release tension, create relaxation and promote a sense well-being.Acupressure mats were recently featured on the Dr. Oz Show where Dr. Oz showed some of the amazing benefits of using an acupressure mat! Basic positions target the back, stomach and hips. 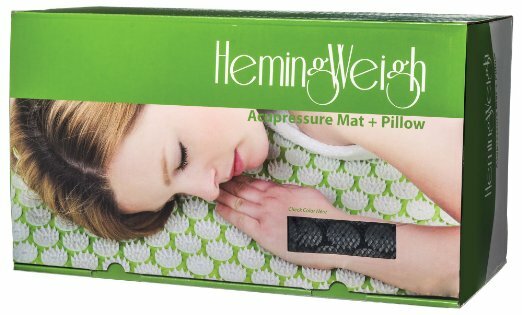 In a research study done by Dr. Zilberter, 98% of the participants reported pain relief, 96% reported relaxation, 94% improved sleep, 81% reported an increase in energy levels after using acupressure mats.These acupressure mats are made from high quality materials, made without any glue, and feature 8820 contact points to help relax your back, neck, shoulders, and legs.The HemingWeigh Acupressure Mats are 29 x 17 x 1 inches in size. Warnings: Do not use an acupressure mat, or consult with your health care practitioner before using an acupressure mat, if you: Are pregnant, Have a blood disorder or are using anticoagulants, Suffer from epilepsy, or have sun burn, or open wounds"